Our dogs provide us with great learning opportunities to practice skills that will come in handy as parents. One of the biggest challenges to tackle is being consistent with boundaries. Like toddlers dogs need clear and defined boundaries. Also like children boundaries may vary depending on the individual dog's behavior and temperment. For example....if you have a dog that is somewhat grumbly about people approaching them or getting into their personal space, then this would be a dog that needs clearer boundaries then a dog that is non reactive and easy going about who approaches and enters their space. The dog that is more sensitive may be restricted from getting comfry in the corner of the couch or sneaking up on the bed or sleeping under the dining room table as these spots might clearly set them up to practice unwanted behavior. Providing alternative spots for this dog where they will not feel the need to grumble and guard while you work on reducing the sensitivity in the "grumble zones" will be helpful with this dog but.....when planning and thinking ahead for a toddler in the home you will need to always keep in mind that this dog has this sensitivity and be aware of it. The dog that is open and happy with approaching people and has no guarding tendencies may have different boundaries. This dog may join you perhaps on the couch with invitation and snuggle in the bed as he has not demonstrated a problem with it. I do like dogs to have an invitation and release command on and off furniture. Like the dog in the photo this type of dog is comfortable and polite while enjoying time close to his person. In order to be able to be close to his "Mom" with a baby he has to have very polite and calm manners for this situation to be safe and this boundary to be permitted. Again, setting a boundary based on their individual temperment and personality is key. This is just one example and again every dog and family dynamic is differnt. One thing I know for sure is true in parenting pets and parenting kids.......consistency is key as is flexibility to change if something is not working. So, if you are expecting and you have a grumbly pooch???? Don't think it will go away once baby arrives!!!!!!!!!!! It won't! 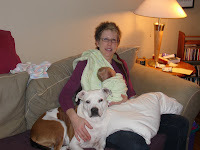 Get help now so you and your dog can be more comfortable and confident once baby arrives!